Microsoft's strategy involves not just creating IT solutions but also in working towards contributing positively to the world through advancements in Cloud Computing. Washington: Microsoft is not only building IT solutions solely to support conspicuous consumption, it is also working to make a positive impact in the world, Microsoft's Indian American CEO Satya Nadella said. "Whether it's helping a 50-year-old insurance business modernise their line-of-business application, or growing a new business from scratch, Microsoft is betting on the future for our collective customers," Mr Nadella told an annual meeting of Microsoft's partners gathered here from across the globe, including 176 from India. "While there is tremendous growth opportunity, we are not building solutions solely to support conspicuous consumption. We are also working to make a positive impact in the world and continue to be encouraged by the enormous potential for partners to have local impact that ultimately has a profound global impact," Mr Nadella said in his key note address, kicking off the 14-day annual meet in the American Capital. Microsoft partners employ 17 million people around the world. Microsoft has 64,000 partners working in cloud services. "While our mission and our commitment to partners is steadfast, technology and technology paradigms come and go. 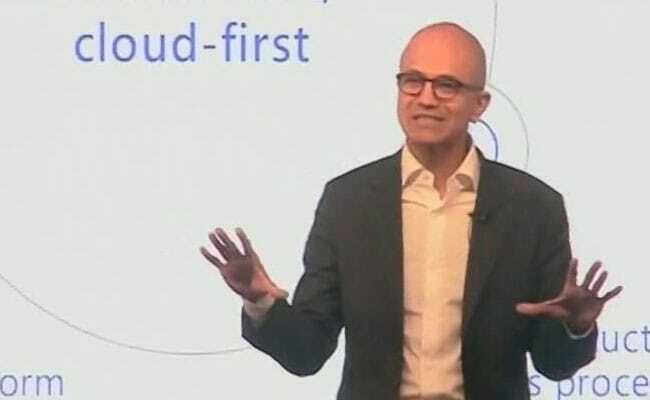 One such evolution is the move from a mobile-first, cloud-first world, to one that is rooted in the intelligent edge and intelligent cloud," the 49-year-old said. This shift will bring about more digital technology in more mainstream ways into every life and every organisation, he said. Observing that digital transformation represents a massive opportunity, Mr Nadella said he sees this trend playing out as every company is impacted by technology in completely new, and sometimes unexpected, ways. "And together we must push ourselves to rethink the opportunity in front of us and our customers," he told the partners. Business leaders are looking at how they can apply digital technology and build systems of intelligence to rethink how to empower employees, engage customers, optimise operations and transform products, he said. "We are making progress, but future growth depends on our collective ability to transcend current product category definitions and business models," he added. The Intelligent Cloud and Intelligent Edge, where every product and every service will have built-in digital cogs, offers an opportunity of USD 4.5 trillion. At Microsoft, we want to democratise this notion of digital transformation so that every business can truly harness the power of this digital era. We must also change how we go to market and better serve customers with core solution areas to enable this digital transformation," Mr Nadella said. Announcing the launch of Microsoft 365, Mr Nadella said that with this and LinkedIn Business Solutions, they have the opportunity to redefine what customers can expect from their business applications. "Organisations of all sizes can now digitise business-critical functions, including relationship sales, talent and people processes, operations, customer service, field service and more," he said. "Together with our partners, we can lead in this new paradigm of business applications, and we will prioritise our efforts across both product and go-to-market strategies," he said. "Instead of sales management, it's social selling; instead of people administration, it's employee engagement. It's about reframing what you want to achieve and having the tools and the infrastructure to help you achieve this new outcome," Mr Nadella said. Asserting that cloud is foundational to enabling digital transformation, the Indian American CEO said they are now moving beyond big data and even machine learning capabilities to be able to infuse cognitive capabilities, like computer vision and understanding natural language, into the applications one builds. "The cloud fueling AI can help every company in every corner of the globe transform, from Liebherr, which is building an intelligent refrigerator, to Boeing, which is now delivering aircrafts with a digital twin, to using commodity cameras with deep neural networks to turn any place into a search engine, and many more," Mr Nadella said.